By now you’ve probably heard some of the messaging coming out of Dreamforce 12, the enormous confab taking place this week in downtown San Francisco and being held by SaaS giant (and former industry upstart) Salesforce. Namely, that the social enterprise is definitely here, and the cloud is where just about everything in our businesses — including marketing, sales, HR, and customer support — will operate in the future. And all of this will be running on always-connected mobile devices bristling with video cameras and location services. Whether or not you actually believe this vision generally depends on who you are. There are certainly still some skeptics about social business, despite a growing number of success stories (and some cautionary tales.) SaaS itself is certainly less controversial and a foregone conclusion in many enterprises for non-mission critical functions. The broader vision of cloud — as a place where our data, software, infrastructure, supply chain, customers and even workers reside, all on-demand — is finally taking shape in IT circles and lines of business alike, though generally more slowly and steadily that vendors might have us believe. Those in IT whose responsibility is connected to business continuity or operations have nightmares about the loss of control, security concerns, manageability, and governance of the whole SaaS, social, mobile vision of the cloud that seems to be forming. Those on the business side worry about these issues too, but generally much less. What does seem clear is that we’re on the verge of yet another shift in the technology landscape. Our software and data is finally becoming highly integrated in a way we couldn’t imagine 5 years ago. As we’ve seen here at Dreamforce, the future of cloud, mobile, and social are heading for new levels of maturity, depth, capability, and interconnectedness. We can also expect the apps and suites of the near future to be layered with big data-style analytics and dashboards so you can actually understand what’s going on. Intelligent context is also arriving as a force and major feature of enterprise applications, allowing solutions to connect to and query a variety of data sources in the background to make work better as it happens. All of this is seemingly impressive and compelling, analogous to the work Apple is doing with iOS in integrating a blizzard of modern yet complex functions into a relatively seemless and usable package. In fact, I’ve likened social networks such as Chatter as a social ‘operating system’ of sorts for enterprises. But that’s not all. The user experience of enterprise software is growing up too. Most of what I saw on stage this week at Dreamforce had polish and an end-to-end, soup-to-nuts feel of completeness to it, even substracting the fact that the presentations were carefully packaged and rehearsed. This is something I’m seeing in next-generation enterprise software suites in general (though less so from traditional vendors), but not until recently in the social business space. It’s very encouraging and an important milestone. I look forward to seeing customers that move from struggling with hard-to-use enteprise software to modern apps that offer highly usable consumer-style user experiences. Consumerization of IT has had an impressive impact in improving user experience and setting the bar on how easy things like data integration should be. Cloud and SaaS grows up, but are enterprises truly ready? As I wrote last year in my analysis of Marc Benioff’s social enterprise vision for its customers that 1) hosting in the cloud and 2) its original roots primarily as a sales tool might hinder broader adoption of its solutions by large enterprises. Based on what I saw this week, the latter issue in particular is steadily disappearing as the company has made many acquisitions in adjacent spaces and seem poised to successfully integrate them well beyond its original vision into marketing, customer support, HR, and more. From this perspective, I think the company is both poised for much-needed horizontal growth into a larger space, as well as a harbinger of what’s to come: Highly integrated turnkey enterprise solutions that make it easy to onboard, adopt, operate in a deeply connected cloud-based business environment. In particular, the point made at the keynote session yesterday that marketing has largely been a bucket of unconnected solutions in most organizations and is ready to grow up into real enterprise solution, like ERP and CRM, is probably correct, though harder in practice due to the inherent innovation and outside-the-box thinking that’s typical of the space. Yet perhaps the most important subject in all this is the maturity of the social business space itself. Social marketing and social workforce were the earliest areas where social media first moved into the enterprise. Both of these functions have experienced a tremendous amount of activity over the years, with resulting lessons learned that have led to a second generation that is more mature, integrated into the business, and cross channel. Along the way, social CRM, social HRM, and social innovation have emerged as significant industries in the social business space as well as more parts of our organizations became social. Just as importantly, the industry has also provided us much needed supporting capabilities that we discoved were essential for using social media effectively in the enterprise. The two most important of these are social analytics and social media management. For its part, social analytics have given us avital feedback loop needed to access the ROI, while the latter has provided a toolset to ensure enterprises can actually exert essential control and oversight over their social business functions across the business. 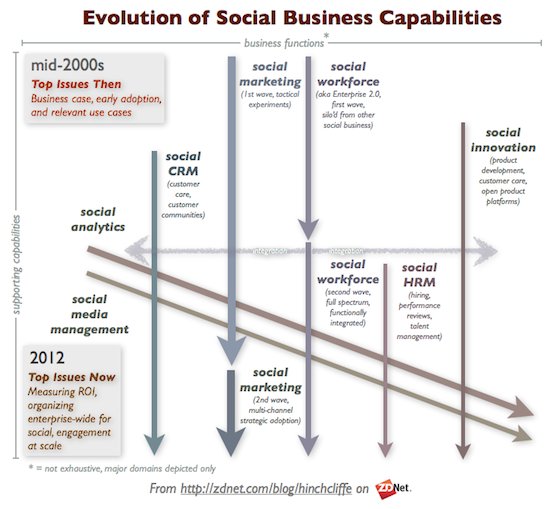 In heartening to see all of these capabilities come together in the next generation of social business offerings. Salesforce is a great — but by no means the only — example here and it’s obvious now where this is all heading. Between Chatter, Work.com, Service Cloud, and Marketing Cloud, along with the analytics capabiities provided by Radian6, Salesforce is coming close to offering just about every major social business functionality required by the modern enterprise in a consistent, integrated, cloud-based, mobile-enabled way. This sets the right bar for the industry and genuinely helps us move our organizations forward with social business. The top issues in social used to be simple: Understanding and articulating the business case, attain early adoption, and figure out the high-value use cases. With the rise of coherent social business suites (Jive and IBM are close and in some cases ahead with this vision) that get us beyond the tactical issues of cobbling together technology, we can now tackle the social business issues of today, namely measuring and optimizing ROI, better integrating social with our business processes, strategically organizing for social business across the enterprise (instead of primarily in functional silos), and engaging with the world at scale. While we have many challenges lying ahead of us as we learn to tranform our cultures for a more connected, open, transparent, and participatory world, I think we’ve finally moving into a place where our actual capabilities can at last match our needs and vision for social business.